Wonderful! Portraying movement in still photographs is a fascinating pursuit…I love to see your interpretations, Karen. It is an absolutely fascinating pursuit. I love the unexpectedness of some of the images. Your moving bicycle photographs are just so wonderful, too, Mic. Obsessions are sometimes inconvenient, but they always enlighten. Yes, I suppose that’s true. This obsession sort of crept up on me but I guess that’s how these things work. I’m madly in love with this piece. Yay! I love that sort of gut reaction, thank you so much for your comment, Kara! A very positive obsession:) Makes me want to stop what I’m doing and start a pastel piece. Beautiful! Oh, I’m glad you think so, Elena, thank you. I just need a full time driver now! : ) Kidding, of course. This sort of work would translate beautifully to the richness of pastel. The static-dynamic quality of this wonderful series makes me feel as if I close my eyes and watch the world go by. The images here were taken traveling while on a moving train. Perhaps that lovely lull of train travel is coming through. Thank you for your thoughtful comment, Marcelo. In the early years of photography, when exposure times were measured in minutes rather than seconds or fractions of a second, photographers often ended up with blurred and ghostly images, especially of people. In modern times, when we can stop motion with high shutter speeds and flash, some of us get fascinated by intentional motion in our images, as you have here. The atavistic bug bit me some years ago too, and I experimented with portraits of people made with exposures of a few seconds, during which time I rotated my camera or zoomed its lens. I couldn’t control the results, and most of the pictures were nothing special, but once in a while something really nice emerged. What fun to play! Your portrait play sounds wonderful, Steve. Do you have any posted somewhere? I have experimented with portrait using in-camera double & triple exposure and I find it fascinating too. The unexpectedness of what can happen is what intrigues me. This is really, really beautiful. It’s like a watercolor..
I’m so glad you like it, Merilee, thank you. I appreciate all your lively feedback, Marina. Thank you! Stunning Image, your creativity is inspiring! Beautiful movements captured on camera, Karen! I so enjoy attempting to make some work with this technique. I’m happy you like it, Millie! This is almost an old master’s Arcadia. That’s such a nice comment, Yoshizen, hanks very much. I really do enjoy this technique! obsessive is good! Beautiful rich grass tones and the layering enhances the feel of movement. It’s like an elegant dance. Ha, well I’m glad you think so, Emily. Thanks very much. I like the idea of the landscape dancing. I’m so glad you are obsessed / fascinated. It makes for fantastic art! Thanks for your comment, Anne, I’m happy you like it. This is beautiful work. It has a ballet style form and quality to it. Not just a fascination……you’re obviously very good at it (creating abstract movement with your camera). Your art hints at the French Impressionist painter’s work. Very creative and skilled at composing a pleasing image – in colour & texture. I hope you keep experimenting the results are fascinating. I love this feeling of the tumultuous coexisting with the serene. your softly etched lines add a very delicate delineation. I find this very spiritual and visceral and beautiful. What a beautiful art painted with your camera! The results of your obsession to explore the “movement” leave us breathless and wanting more! Spectacular work! Living and breathing and beautiful. Fascinating. 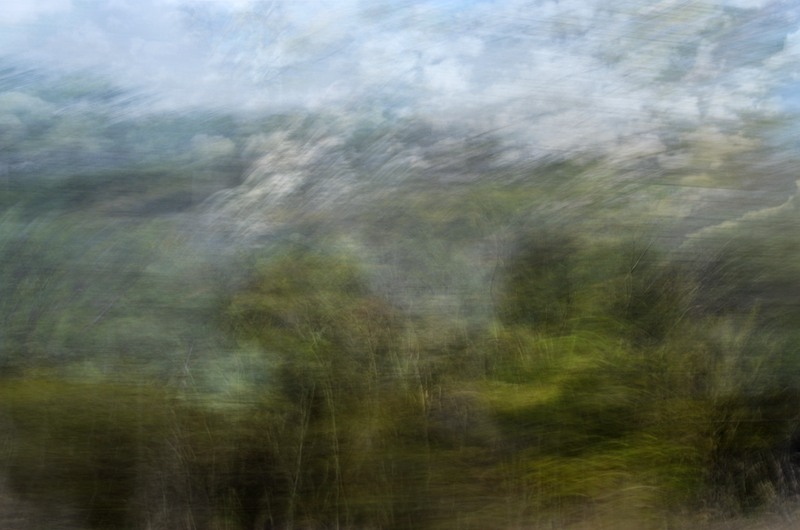 Movement and Impressionism but enough of a suggestion of the landscape to draw me in and feel the scene. Thank you, Karen. Wow, Karen, each obsessive post get better and better. I second all the above comments. Once more, the beauty of your work is beyond the limited range of my vocabulary, Karen. Excellent! Your photography is inspiring! This is so much like early Whistler or Turner abstractions. Fabulous exploration. So beautiful and original art…Your works are filled to wonderful discovery and encounter. Beautiful image! Interesting process. I loce such a special result. PS: Be careful when driving! And I thought you were painting these…this is amazing. I have been playing with my photographs on photoshop for ages it seems. I think there is endless exploration when combining digital artistic uses. I love these and you do it so effortlessly. Turneresque feel, love these Karen and the confusing yet inviting sense of perspective! I tried to look for the right “-ism” to describe this piece, but realized just one or a few of those would have put it in a box, when your work comes across as liberating and free. But just gonna say that this picture particularly caught my attention with its composition, colors and like you said… the study of movement under which a landscape emerges from is quite stunning, nicely done.